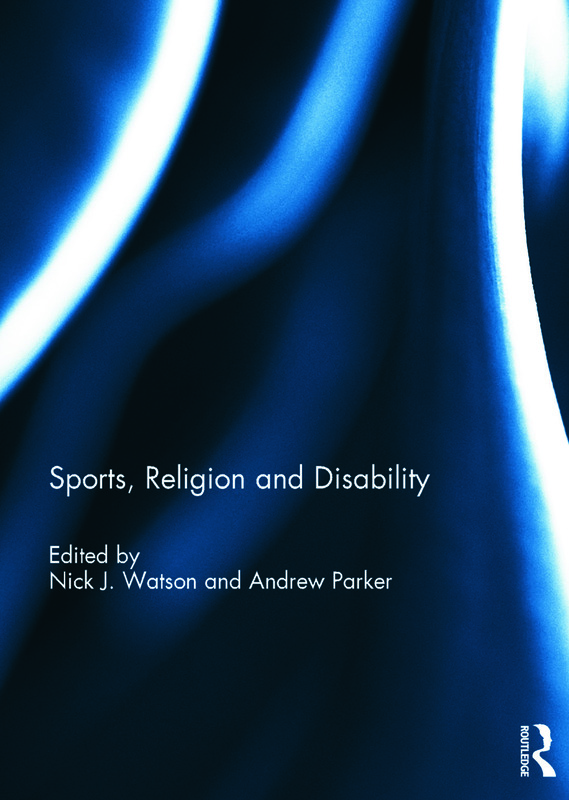 This ground-breaking book provides a fascinating insight into the relationship between sports (and leisure), religion and disability. In the shadow of the London 2012 Olympic and Paralympic Games, at which athletes that were both able-bodied and disabled, provided an extravaganza of sporting excellence and drama, this text is a timely and important synthesis of ideas that have emerged in two previously distinct areas of research: (i) ‘disability sport’ and (ii) the ‘theology of disability’. Many of the elite athletes at this global sporting mega-event often explicitly displayed their religious beliefs, and in turn their importance in the context of sport, by observing different religious rituals, and or, utilising the multi-faith sports chaplaincy service. This raises a whole range of unanswered questions with regard to the intersections between sports, religion and disability, which to-date has been under- researched. Examples of subjects addressed in this text include: elite physical disability sport--Paralympics; intellectual disability sport--Special Olympics; reflections on the illness narrative of the cyclist Lance Armstrong through the lens of the theology of ‘radical orthodoxy’; the application of biblical athletic metaphors in understanding modern conceptions of disability sport; the role of sport and spirituality in the rehabilitation of injured British Military personnel, and; the importance of sports and leisure in L’Arche communities. This book begins a critical conversation on these topics, and many others, for both researchers and practitioners. This book was based on two special issues of the Journal of Religion, Disability and Health. "The relationship between religion, sport, and disability is a field of enquiry that has been gaining a good deal of traction recently. The subtle but fascinating tensions between the desire to win and the humility and alternative goals that many religious systems require open up a fascinating and multifaceted interdisciplinary conversation that has the potential to enhance and challenge both religion and sport … It is this tension between strength and weakness, competition and humility that runs like a golden thread through the text … The book comprises 14 essays written by people coming from a variety of different perspectives. The interdisciplinary nature of the text means that it is both theoretically rich and practically helpful. Taken together, the essays function to create a rich bricolage of perspectives that gives the reader deep insights into the important connections between religion, sport, and disability … This is a fascinating and original book that has important theoretical and practical implications. In particular, the papers that use qualitative research to gain first-hand experience of disability and sport offer vital insights for practitioners into the ways that people with disabilities perceive and use sport and the therapeutic significance of such engagement … As a resource this book functions well at both the scholarly and the practical level. For those already working in the field, the book offers some fresh original thinking. For those who are just beginning their interest in disability and sport, this book is an ideal introduction to many of the key issues." "This volume brings together two issues of the Journal of Religion and Disability, adding a new introduction and preface by the well-known disability ministry figure Joni Erickson Tada as well as a previously unpublished final chapter by the editors. The volume was conceived as a response to the London 2012 Paralympics, but the goals of the volume are much more ambitious: to remedy the lack of both empirical and theoretical investigation of the role of spirituality in the sporting activities of persons with disabilities, to offer some practical guidance and insight for those working with disabled people in sport and leisure contexts, and, by looking at sport in this domain, to raise a significant challenge to the ‘cult of normalcy’ and hyper-competitiveness that is so dominant in contemporary sporting cultures … There are excellent articles fleshing this argument out in relation to the apostle Paul’s understanding of competition and the body as well as detailed empirical and conceptual investigations of how special Olympians (like Oscar Pistorius) can, no less than sports idols such as Lance Armstrong (the language here is intentional), succumb to the vices that beset professional athletes in all fields. This is a ground-breaking work that opens up important questions not only about disability but also about the ways in which we think about and engage with sports today." Dr Nick J. Watson is Senior Lecturer in Sport, Culture and Religion at York St John University (YSJU), UK, and is head of pastoral care for sports students. He was the Founding Director of the Centre for the Study of Sport and Spirituality (YSJU, 2003-2009) and is the co-author / editor of a number of books on sport and Christianity. Andrew Parker is Professor of Sport and Christian Outreach and Director of the Centre for Sport, Spirituality and Religion (CSSR)in the Faculty of Applied Sciences at the University of Gloucestershire, UK. He is former co-editor of the International Journal of Religion and Sport.